The Carolina Solar Security team has been serving our customers’ window film needs for over 30 years. In that time we have heard many myths about window film. Below we provide the truth about some of the most common myths we hear. One idea that is widely held but not true is that window film is only beneficial when it’s hot outside. In fact, window film works to increase the comfort of your space year-round by maintaining the temperature you create indoors, regardless of how hot or cold it is outside. There is even a window film product specifically designed to insulate your windows against the cold: Thinsulate insulating film. Along the same vein as Myth 1, many believe that the only purpose for window film is controlling indoor climate. The truth is, there are a number of window film products designed with other primary goals in mind. For instance, if you are worried about break-ins and smash-and-grab crime, safety and security window film can help keep you protected. This product reinforces your window, making it more difficult for a would-be intruder to break through the glass. If you have a large window in your bathroom, you might also consider privacy film to keep prying eyes at bay. If you want to freshen up the look of your space or simply add style to your windows, decorative films are available in hundreds of patterns and finishes. Even our sun control film has benefits beyond temperature regulation — it blocks up to 99% of UV rays from passing through your windows. This protects not only your skin, but also your furniture and floors. The truth behind this myth is that there’s a window film solution for every problem. While some films do have a tinted appearance, our 3M window films are available in a full spectrum of clarity, from transparent to opaque. If you prefer to maintain the clear appearance of your windows, then one of our virtually transparent films will be the best choice. On the other hand, if you want to increase privacy, one of our frosted window films will provide the ideal solution. When window film is applied by a 3MTM authorized professional installer like Carolina Solar Security, the finish will be clean with no bubbles, warping, or other unsightly flaws. Our products are also backed by the 3M warranty, one of the most comprehensive warranties in the industry. 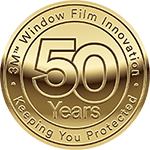 When you choose a premium quality film, you can rest assured that your windows will continue to look great for years to come. Want to Learn More About Window Film? Carolina Solar Security is a premium 3M™ Authorized Window Film Dealer in Wilmington, NC. We have been providing North Carolina homeowners and business owners with window tinting solutions since 1985 and never stop working to bring our customers the best products paired with the most skilled window film technicians. Reach out to us for your free quote today!